Over the past years, prices for solar cooling kits went down in Europe by 45 to 55 %. 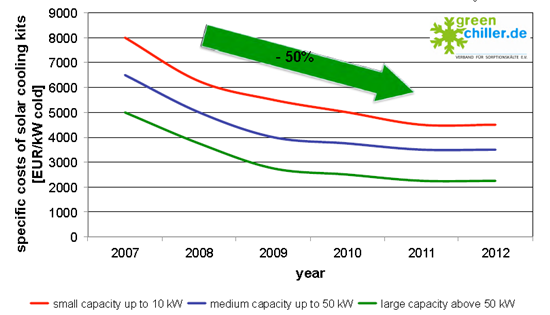 In 2012, one kW of cooling capacity ranged from EUR 2,200 for a large plant with more than 50 kW to EUR 4,500 for a small system with less than 10 kW of cooling power (see chart above). In 2007, prices ranged from EUR 5,000 to EUR 8,000, depending on the system’s size. The kits consist of solar collectors, mounting systems, storage tanks, pumps, chillers and re-coolers. The main reason why their prices have gone down so much is that collectors of all systems sizes and, in case of small systems, chillers in particular have become more inexpensive – an increasing chiller production has caused prices to fall. “There are more and more standardised solar cooling kits available. They play a major role in reducing costs,” Jakob said. His presentation showed new absorption and adsorption chillers which have made it onto the European market in recent years, from systems by Dutch SolabCool and Austrian Pink to German systems by SorTech, InvenSor, EAW, Fischer Eco Solutions, Baelz, AGO, Tranter Solarice, En-Save, Köhler Industries and SolarNext. 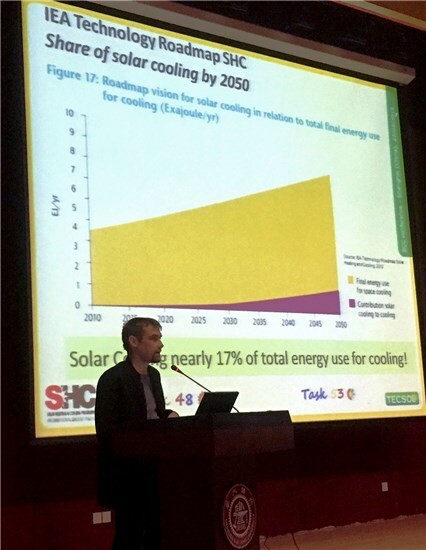 “Solar heat is of particular interest as a source of cooling energy if the system is used for other heat requirements as well,” Jakob says. There are two market projects which exemplify this approach: A German project combining solar heating, drinking hot water and cooling, which is currently undergoing field tests and was developed by Solvis, SorTech and the Fraunhofer Institute for Solar Energy Systems, and a second system from Italy, which is under commercial development and was designed by private research centre European Academy of Bozen/Bolzano and Velta Italia, a company specialised in floor heating and cooling systems.